Ketogenic Diets: Do They Work Or Not? Home KETO INSIGHTS Ketogenic Diets: Do They Work Or Not? Slashing carbs and eating fats to enter ketosis; effective for weight loss? Carb-haters are uniting around the keto diet, which is rooted in older therapeutic diets originally designed for purposes in neurologic medicine, like for controlling seizures in children. Studies also suggest those with Parkinson’s and Alzheimer’s may benefit. So what is it? Essentially, the keto diet requires ditching carbs and replacing them with fats and some proteins. Typical keto diets push daily calorie intake from fats over 70 percent. High fat and absent carbs put the body in a state of ketosis, meaning the body begins breaking down both dietary and stored body fat into substances called ketones. Typically, the body relies on sugars for energy, but the keto diet shifts energy production to be sourced from fats. Let’s start from the beginning. Ketosis is a natural process that the body initiates to help survive when food intake is low. During ketosis, our bodies produce ketones. Ketones are important fuel molecules formed by the breakdown of stored fat. The body stores about 40,000 calories of fat and 2,000 calories of carbohydrate glycogen. When the body uses all the stored carbs, it proceeds to the fat calories to get energy, therefore, fat becomes the body’s fuel. Most of us never fully enter ketosis because we go through a system of eating carbs, burning carbs, eating carbs and burning carbs. For example, we eat carbs for breakfast, causing the blood sugar to rise and then right as it begins to deplete we reach for our next meal. Getting your body into ketosis mode is no small task; you must restrict yourself from eating all starchy vegetables, breads, sugary drinks, pasta and basically anything that isn’t a non-starchy vegetable (spinach or kale) or meat. However, limiting yourself is not the only difficulty to the diet. 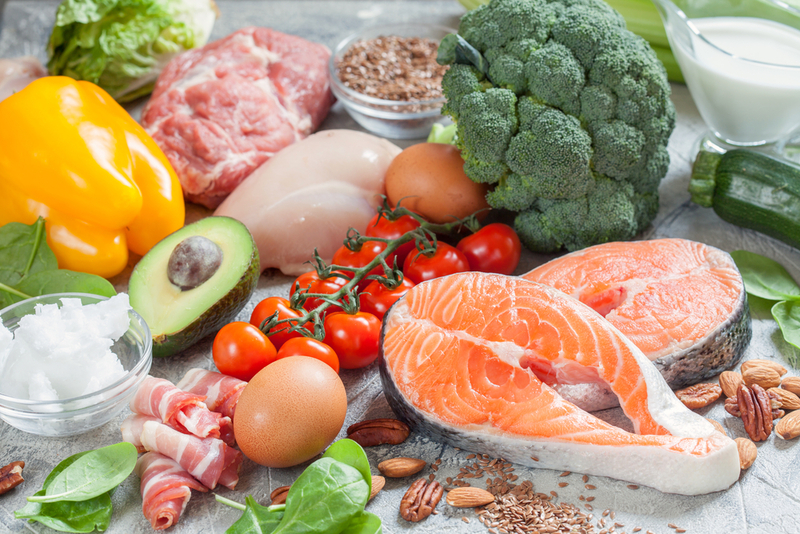 When cutting yourself off from carb-heavy foods most people experience what is called a “low-carb flu.” The low-carb flu occurs during the first few weeks of the keto diet, and causes a person to feel mentally and physically weak to a point where it’s unmistakably uncomfortable. You might feel hungry even after eating, lethargic, dizzy, and low on energy. You may have experienced ketosis if you’ve ever fasted, or skipped a couple meals. By not eating for 12 hours or more the body will go into a fat burning mode. The easiest way to do this would be to eat dinner, skip breakfast and then eat your next meal at lunch. So does it work? Some studies do show that the keto diet can result in short-term weight loss, but research is limited. It should be said that the keto diet takes several different variations, and therefore results may vary. Some follow the keto ways for the potential mental health benefits, not for weight loss. Though there are many upsides to the diet, be warned of several things. First, slashing carbs to this extent can be difficult. Further, because the ketogenic diet is very restrictive it doesn’t always provide all the essential nutrients the body needs, and taking vitamin supplements are advised. The ketogenic diet is low in dietary fiber, so you’d want to make sure your digestive system is working properly and to watch it closely throughout the diet. Due to its restrictiveness, the ketogenic diet can be counteractive as people tend to overeat when they restrict themselves. Recent rankings from US News and World Report place the keto diet tied for last (39th) on their recent 2018 list of “Best Diets.” Some are concerned about its safety, particularly for those with liver or kidney conditions. In fact, the report ranks it 1.9/5 overall, 2.8/5 for weight loss, and 1.6/5 in the “healthy” category. Still, keto diets remain popular, in part because of celebrities. Notably, NBA star Lebron James was a proponent of low carb, high fat diets that promote ketosis. Keto diets might be hard to stick with because of drastic carb reduction, and might not always result in meaningful weight loss. Research does suggest benefit for some neurological conditions.